West Yorkshire Police have taken the Enable UK football policing approach across the border to Lancashire. Enable UK is a collaboration between forces, academics, fans representatives and safety officers to reform the approach to policing football fans. ‘Enable UK has brought two forces together in a different way to explore reforms in football policing. 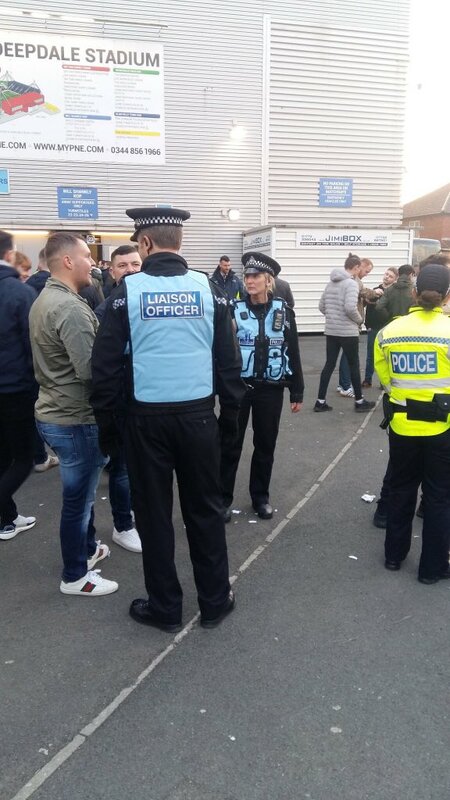 ‘West Yorkshire Police Liaison Officers worked under the command of Lancashire Police at the Preston North End V Leeds United game on Tuesday. ‘Specially trained liaison officers are now being used in football to meet and greet fans, problem solve and adopt a more community style of policing. Lancashire Constabulary said they were pleased to be working with Enable UK and West Yorkshire Police to better police football and crowded space events. ‘This is truly a collaborative approach between forces and supported by academic assessment to improve public order policing. What is refreshing is the experience for the public is the primary consideration along with keeping people safe. ‘Consistency in how supporters are treated throughout their day is important and should positively impact on behaviour.